Servicing today's digital passengers is the goal. Keeping critical airport functions operating is the expectation. Airport management can achieve both - if they implement strategies to overcome the major technological challenges that stand in their way. FNT invites you to join Klaus Schultz-Fademrecht, Vice President IT Communication at Frankfurt Airport, for an informative discussion about how Germany's busiest aviation hub successfully modernized its infrastructure to achieve these dual objectives: improve airport operations and support the digital passenger journey. Data Center operators are no strangers to dealing with the pressures of a changing environment. New technologies, applications and architectures will always arise to shake things up. It’s how they respond that will differentiate those that flourish and prosper from those whose ongoing viability will be jeopardized. Today’s changes are no exception. The explosive growth in network traffic - both within and between data centers - will reach unprecedented levels. Cloud-based services and distributed databases and functions will push networks to their limits. Applications and architectures are increasingly dependent on effective network design and performance to meet service level goals. Connectivity infrastructure will be tested, as will MTDC and hosting providers’ ability to innovate and invest. This trend is shining the spotlight on data center operators, especially colocation companies, who need good visibility, control and processes to deal with fast growing, complex and often dynamic networks. Strategies exist that data centers and colocation providers can employ to thrive in this kinetic environment. These strategies revolve around connectivity. New connectivity products and services, such as Enterprise Connectivity, Disaster Recovery and Ecosystem Peering, are fast finding their way into providers’ service portfolios. While exciting, efficient network operation and quality service are required to successfully offer these new products. A central database is the key, as that is the cornerstone for enabling the planning, managing and integration of used resources in the data center and the network infrastructure. Learn how to use such a database to standardize infrastructures, ensure efficient change processes and secure maintenance and operation of your MTDC or colocation center. Putting the customer center-stage when defining the service portfolio is crucial in order to stay successful in a highly competitive market. However, service providers in the multi-tenant and hosting market need to leverage a new catalog-driven approach to drive their organization end-2-end: from order management, delivery and provisioning, to billing, accounting and finally, to operation. In this interview, service management expert Patrick Büch explains how to tackle today’s challenges and how to increase an organization’s flexibility and agility in terms of how services are offered to the customer. For more details, please see the further information in the section "attchments": Expert Paper and website link. The times where IT executives have traditionally been focused on cost control and managing the day-to-day running of IT are eventually gone. CIOs are challenged in refocus their priorities towards business initiatives and revenue growth. This can be a demanding task as many IT organizations still act in a re-active manner and follow a classic build-to-order approach. This must be changed and service management is the key to success. However just establishing an service organization is not enough. An outside-in perspective is necessary, looking at the organization from the customer’s viewpoint and using this perspective to design new services that actually provide value to business. This webinar examines the necessary changes in service organizations and how these will unleash hidden potentials like for example a significant reduction in costs. As digitization progresses, the management of hybrid IT environments is more challenging than ever before. Service managers need tools to achieve better efficiency in service provisioning and service delivery while reducing the time-to-market and time-to-deliver. How can this transformation be aligned with business needs? Watch our video to learn the about the two essentials for state-of-the-art IT Service Management, and how it helps you to find the right balance between costs, risk, and agility. During the keynote FNT presented its vision of being the engine of the ICT factory for organizations in the era of the digital transformation. FNT also presented the resulting product strategy and gave a live demo of an integrated customer use case based on FNT's products FNT Command, FNT ServicePlanet, FNT ProcessEngine, FNT Monitoring etc. FNT also presented in the live case how Virtual Reality and Augmented Reality technologies will influence the discipline of data center management in the future. “Internet of computers” + “Internet of things” + “Industry 4.0” = “Internet of Everything.” That means huge growth in the volume of data that has to be transmitted, processed, and stored. To accommodate this growth, automated data center management systems are essential for provisioning and management of a large number of assets and connections. All activities and changes must be logged for later reference and auditing. Unauthorized changes should automatically generate alarms, thus enabling rapid fault location and correction. To optimize data center infrastructure operation and for precise capacity planning, the system needs to provide tailored reports and analysis. The combination of R&MinteliPhy expertise and FNT technology delivers unique transparency and control in the data center. The colocation industry is currently undergoing a significant change. Traditionally, it has focused solely on providing power, cooling and space at scale, but with high resilience, today’s buyers are more frequently expecting additional services to be made available. Join us for this BrightTALK webinar, where we’ll discuss what these additional services are and how you can enable your organisation to deliver these with the support of FNT’s market leading software suite to support your future growth. To access information just in time and whenever needed greatly enhances productivity and agility. Therefore, mobile devices such as tablets or smartphones offer a huge range of useful features to accelerate daily work processes. From the control of work orders to automated data collection, numerous options emerge as to how direct access to IT services or asset data can be provided just-in-time and therefore support work processes efficiently. In this webcast, Horst Haag will show how mobile devices and applications, such as FNT Command Mobile, can become an indispensable companion for your Service Asset and Configuration Management. Data Center Colocation Providers are operating in a challenging and competitive environment. Commoditization of space and power is driving colocation providers to differentiate through an extended product and service portfolio. This diversification requires management solutions that support streamlined operational processes in order to deliver these services with the highest level of quality at minimal cost. FNT‘s solution addresses this challenge by providing a holistic view of all the different resources and services as part of the offered product and service portfolio to be managed by the Colocation provider. Not only space, power and cooling, but also for example the physical cable as well as the logical transport connections are covered to ensure customer SLAs and efficient operations. 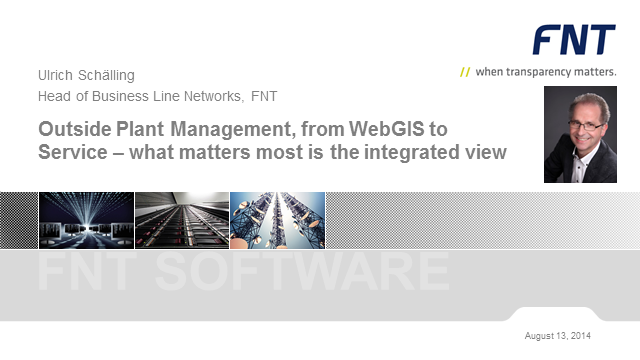 The FNT solution bridges the gap not only between Facility and Telecommunications but also IT and supports various diversification scenarios such as remote multi-tenancy asset management for end customer cages and suites. Integrated within colocation operator's processes, the FNT solution leads to unparalleled operational efficiency and unprecedented provisioning speed and quality. Todays businesses are increasingly demanding their IT functions to strike the right balance between cost, risk and agility to meet the ever-changing demands of the business’ key functions. Analyst firm Gartner recommends driving towards Bimodal IT in the pursue of maximum flexibility in the IT eco-system. Also companies like Google, Facebook and Netflix have demonstrated the value of Web-scale IT, by achieving ultimate scalability and agility at minimum risk and cost. But what can the rest of us mortals do if we don’t have the size of Google, the deep pockets of Facebook or the momentum of Netflix? Can we still benefit from Web-scale IT (spoiler alert: We can!) and should Bimodal IT even be in our vocabulary (spoiler alert: It should!) and more importantly: What can we do today to prepare ourselves for this new reality? Take metrics and measurements to the next level: key performance indicators bring transparency into your data center management. The data center was seen as a cost factor in the past, whereas for modern organizations it is the driver of business. Put a value to its contribution by measuring the right values. Rather than concentrating on technical details of data center operations, business oriented indicators put value to your data center output and allow you to involve your senior management. In this webcast Oliver Lindner, Business Line Manager for Data Centers, gives you practical examples and shows how to design KPIs that fit your business needs. -How do you model Integrations Jobs for FNT Command with the FNT StagingArea? -What are the Monitoring and Reporting capabilities? -What are the features of the next Releases? In this webcast the Product Manager Markus Kohn presents a live-demo of the modern ETL tool FNT StagingArea. It will show you how easy the modeling of interfaces for different integration scenarios can be. With headquarter in Ellwangen / Germany, FNT's innovative software suite FNT Command is used worldwide as an OSS / IT management application for communications service providers, enterprises and governmental organizations by more than 25.000 users since 1994. FNT’s customer base includes with more than 500 customers a wide range of well-known organizations working in various sectors, such as the automotive industry, banks, insurers, chemicals, energy management, airports, clinics, media, industry, telecommunications and IT service providers as well as public institutions. Almost half of Germany's DAX30 listed companies are part of the customer base. FNT operates internationally and has subsidiaries in the United States (Parsippany, New Jersey), Dubai, Mosocw and Singapore.